EAS shipping systems for refrigerated specimens feature Therapak’s standard small insulated cooler (ID: 8 x 6 x 8”) and transport box (OD: 11 x 9 x 11”), which is ideal for overnight shipments via common carriers such as DHL and FedEx. 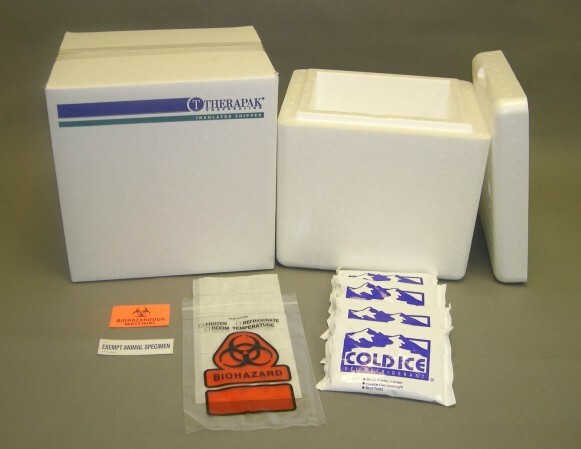 Refrigerated shipping system includes: 8-oz cold packs, specimen bag, absorbent material, Exempt Animal Specimen label, biohazard label and cushioning material. Each case includes one set of packing instructions.